Lesson of the month? Have multiple income streams. You never know how one month is going to fare compared to the next. Multiple clients, multiple businesses, multiple whatever. Find multiple ways to earn money. Take Reese Witherspoon for example. You may have seen her in Big Little Lies, Sing, or Hot Pursuit. She gets paid to act, we know that. But she also has a lifestyle brand Draper James that sells clothing, handbags, jewelry, & home accents. She established the production company, Pacific Standard. She was a global ambassador for Avon. I mean, she has a lot going on. That's business. She doesn't rely on just one income stream. Note: I base my blogging income report on earnings that were deposited into my bank account during that month. I did a couple projects in August that have yet to be paid out, therefore I will take that into account for my September blogging income report. Another great coaching month. You can read all about my first in-person coaching intensive, where I spent three hours working with a client. As a coach, I teach, listen, & empower people one-on-one to enhance their blogs, their social media presence, & their brands. I'm strategizing how I can make coaching a bigger part of my income. Learn more about my coaching & how it could help you! Linqia was a notable part of my income in August. I received payment for two campaigns: Just a Sprinkle of California Love ♥, a sponsored post I did with ForRent.com, as well as Persian Food, Mexican Beer, & How I Travel Without a Plane Ticket with Estrella Jalisco (a Mexican beer). I got paid for How to Create Your Own Wine Spritzer Bar, a sponsored post I did with Clos du Bois! I had so much fun with this campaign. Linqia has been a consistent part of my blogging income over the course of multiple months. 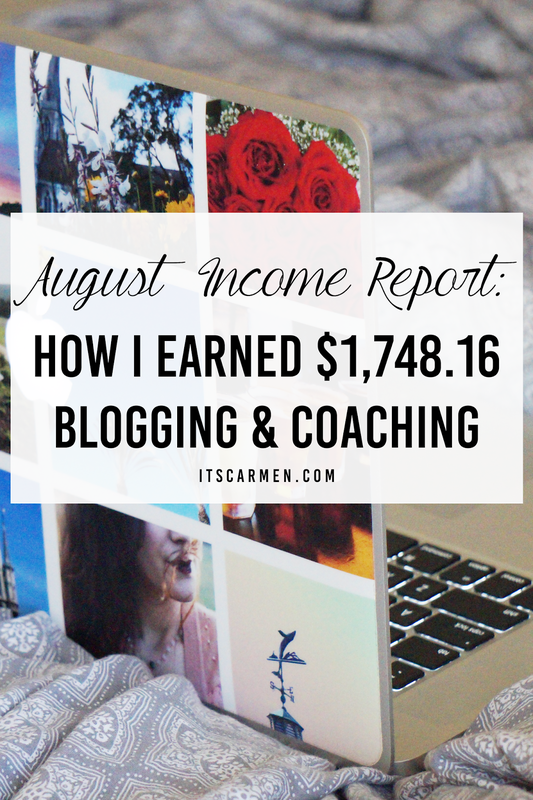 I've included it on my blogging income reports, so some people sign up. I receive $5 for anyone who's accepted into the Linqia network. Sooo, that was my August. It's been a marvelous, eye-opening, enriching, beautiful month. Zero of which would've been possible if I was still at a 9 to 5 job. Make sure to follow along on my Instagram Story for more behind-the-scenes photos & videos! I think it's great that you share this information! I have recently become self employed and am setting up my own business. My blog only started this year and am definitely interested in monetizing it if possible! It is really interested to see the actually breakdown of where your blogging income is made up. This is really helpful and so fascinsting. You've done so well. You've definitely worked so hard and created something all yours from this! Lovely to read. You go girl! Looks like August was a great month for you. This is awesome and inspiring to new bloggers. I'm wanting to dive into coaching myself. I'm retired from the military and would like to use those skills to help others make their lives better. Great job! Holy cow! That is absolutely amazing and so motivating for me! What fabulous online income! I love that you're able to up the figure with online coaching. I can hardly wait to see what amazing income the 4th quarter will bring. Congrats great job! All the best for another bumper month in September! Thanks for your post Carmen. It is both refreshing and encouraging to see some real numbers in a segment flooded with "how I earned a 6 figure income while sipping cocktails at a beach-side bar'. I love that you share links to Linqia and Social Fabric - talk about an attitude of abundance! This is great news Carmen, and so so happy your biz is taking off! I loved my coaching session with you..just getting it all into action with a full time job is the challenge. Little by little! I think having multiple income streams is so smart. I like seeing how people make money from their blogs. Woo-hoo!!! Carmen, you are killing the game on so many levels. Congratulations on diversifying your income stream. That's a very smart strategy. Love these! The fact that you can diversify your blogging income in so many ways just shows that any type of blogger can make money. Ana - Blogger at www.TheSheApproach.com and big supporter of women who are building an empire online through blogging! Congrats to you! This is so exciting and I am so inspired by your creativity and ambition! So true. Thank you so much, Ana!